Place the Crescenza into a pie pan or non-reactive baking dish. Combine the chopped herbs and the extra virgin olive oil, pour over the cheese, and season well with salt and pepper. This may be done up to three days in advance. Just before serving, cut the cheese into 24 pieces with a spoon. "Turn" the artichokes by removing the tough outer leaves with a knife and trimming any of the green part away. Cut in half and remove the choke if it is tough. Place into water with the juice of the lemon to prevent browning. When all of the artichokes have been prepared, slice them to 1/8-inch thick pieces. Place the pure olive oil into a sauté pan, heat over medium heat, add the artichokes, and increase the heat to medium high. Season with salt and pepper. Allow the artichokes to cook for 5 to 7 minutes or until nicely golden brown and no longer al dente. Remove from the pan and allow to drain on a paper towel. Make the vinaigrette by whisking together the balsamic and the extra virgin olive oil, then season to taste with salt and pepper. Combine the greens and the basil in a large mixing bowl. Tear the bread into half inch pieces. Place the pure olive oil into a large sauté pan and add the bread. Season well with salt and pepper and cook for about 3 to 4 minutes, or until browned. Add the artichokes and heat until warm. 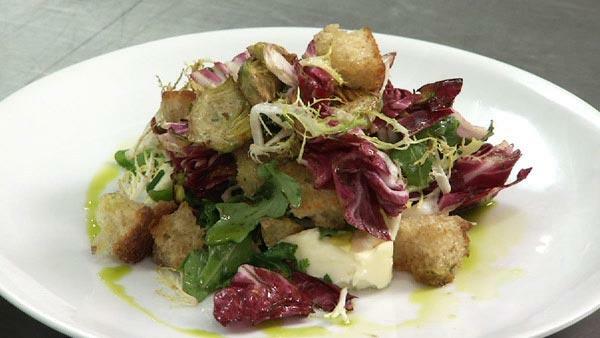 Place the greens in a large mixing bowl, add the warm artichokes and bread, and dress with the vinaigrette and seasoning. Present on large individual plates with three pieces of cheese around the perimeter of the plate. Place the salad in the middle.